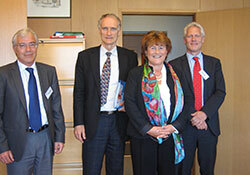 From left: Mr Mogens Jørgensen, Head of division, Ministry of the Interior and Health, Mr Bertel Haarder, Minister for the Interior and Health of Denmark, Ms Zsuzsanna Jakab, WHO Regional Director for Europe, and Mr Jesper Fisker, Chief Medical Officer, Danish National Board of Health. On Tuesday, Mr Bertel Haarder, Minister for the Interior and Health of Denmark met Ms Zsuzsanna Jakab, WHO Regional Director for Europe, for the first time. Their informal discussion covered the Regional Director’s priorities and vision for WHO in the European Region. It focused particularly on areas including an action plan for the European Strategy for the Prevention and Control of Noncommunicable Diseases, antimicrobial resistance, strengthening of primary health care, infectious diseases (tuberculosis, measles and poliomyelitis) and health systems. The Danish Minister welcomed these plans. Ms Jakab also invited Mr Haarder to the sixtieth session of the WHO Regional Committee for Europe, taking place in Moscow, Russian Federation in September 2010. The Minister and Regional Director will meet again on 21–22 June 2010 at the meeting of Nordic ministers in Aalborg, Denmark.